This Shrimp, Avocado and Grapefruit Salad can be enjoyed all year long, but is especially nice in the winter when local produce is not available. 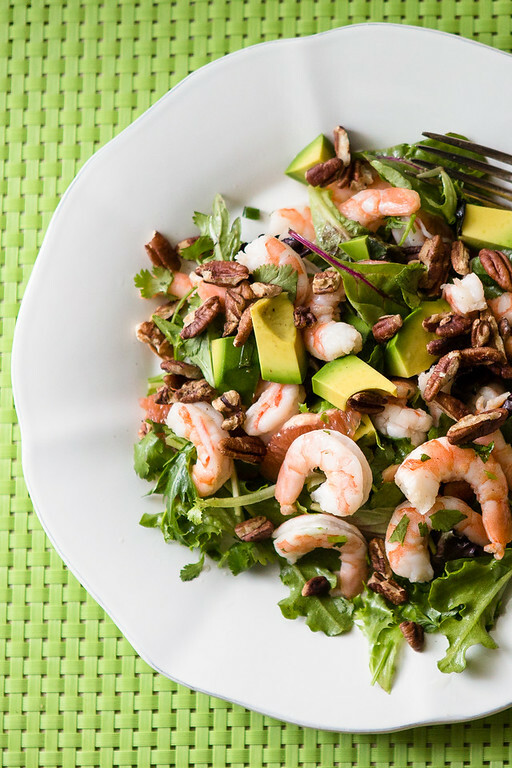 Succulent shrimp, creamy avocado, tart grapefruit, crunchy pecans and crisp lettuce get tossed in a cilantro lime vinaigrette. Last week, I shared an easy winter salad – Chicken Waldorf Salad. Even though cold weather calls for bowls full of comfort, I sometimes crave something a little lighter. A salad. But not a summer salad, not filled with fresh tomatoes and fresh corn, something that feels decidedly more winter. One of the things we can definitely enjoy about winter is citrus! All that lovely citrus that fills the grocery stores and markets right now. Avocados are available year round and they pair beautifully with citrus. Making a salad that includes citrus and avocados a perfect winter salad. Cooked Shrimp – if you don’t have cooked shrimp, my favorite way to cook them is to roast them in the oven. Toss them with a little olive oil, salt and pepper and spread on a baking sheet. Roast in a preheated 400 degree oven for 6-8 minutes. Grapefruit – pink or white. Toasted Pecans – toast pecans in a dry skillet over medium high heat until fragrant. Limes – juice of 3 limes. Zest the limes before juicing and store in freezer to use in another recipe. Cilantro – use the leaves, save the stems for soup. Green Chili Pepper – seed if you don’t want the heat. I used a jalapeño. Divide lettuce between two plates. Top with shrimp, avocado and grapefruit. Place lime juice, cilantro, mint, green chili pepper, honey, and fish sauce in a blender. Process for about a minute or two. Drizzle over the salad and top with pecans. This was so good. The shrimp and avocado added richness, the grapefruit and the lime dressing added a sweet tart flavor. The pecans added a delightful nutty crunch. Perfectly balanced flavors. A delicious, light main dish salad that can be on the table in under 30 minutes! I found this recipe in Miss Dahl’s Voluptuous Delights. This is such a wonderful winter salad! The richness of the shrimp and avocado is cut by the tartness of the grapefruit and watercress. Arrange the shrimp, avocado, grapefruit, and lettuce on a plate. Place the dressing ingredients in a blender and process for just a minute or two. Pour the dressing over the salad and top with the pecans. Cooked Shrimp - if you don't have cooked shrimp, my favorite way to cook them is to roast them in the oven. Toss them with a little olive oil, salt and pepper and spread on a baking sheet. Roast in a preheated 400 degree oven for 6-8 minutes. Grapefruit - pink or white. Toasted Pecans - toast pecans in a dry skillet over medium high heat until fragrant. Limes - juice of 3 limes. Zest the limes before juicing and store the zest in freezer to use in another recipe. Cilantro - use the leaves, save the stems for soup. Green Chili Pepper - seed if you don't want the heat. I used a jalapeño. This was originally published in 2015 and has been updated in 2019. I’d happily eat this for a summer supper. Recipe sounds wonderful but can’t serve grapefruit do to meds that my husband takes. Can you suggest a replacement for the grapefruit? I love adding a protein and having salads in the winter. This sounds absolutely delicious! I love the idea of grapefruit and shrimp paired together! Grapefruit and shrimp pair so wonderfully together! Yummy…it looks delicious. I’ll surely try this recipe. Thanks for sharing! cilantro and lime… I pretty much don’t care what else you add to it. Seriously… I love the freshness of this dish and grapefruit? YUM! I get lost on the Anthropologie website, looking at knobs, dishes, whatnot. Cookbooks would take me over the top with joy. 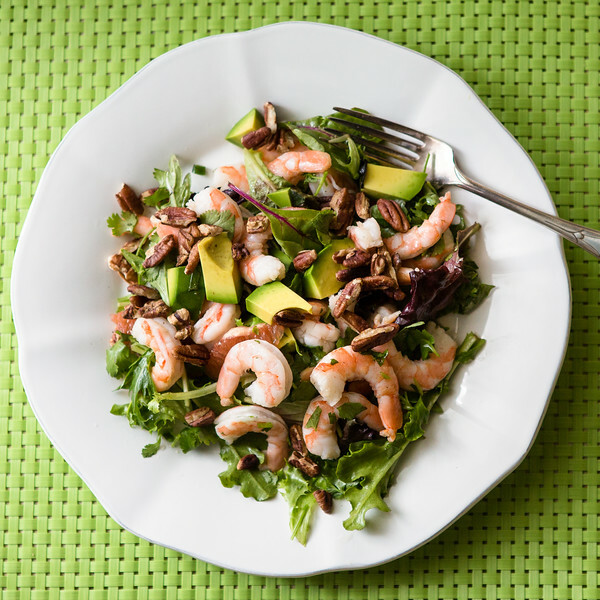 I love the medley of ingredients in this salad–seafood, citrus, avocado. Perfect trio. Anthropologie hasn’t made it to Australia yet so we are safe. . . for now. I don’t even know if there is an Anthropologie store near me. 2 days before Christmas I went into a TJ Maxx for the first time ever, so you know I’m an absurdly not-with-it shopper, right? Anyway, it’s always nice to find a gem of a recipe in an adorable cookbook that you’d forgotten you had. Have you surpassed the 200 cookbook mark yet? I can’t even go into Anthro! That’s how bad my ACS is. But….maybe I need to make an exception to see if they still have this cookbook? Love all the freshness in this salad!